I have breadboarded one and knowing all kinds of filters, I got to say this one is really unique sounding, not hifi, but alive and musically nonlinear! I love it totally! 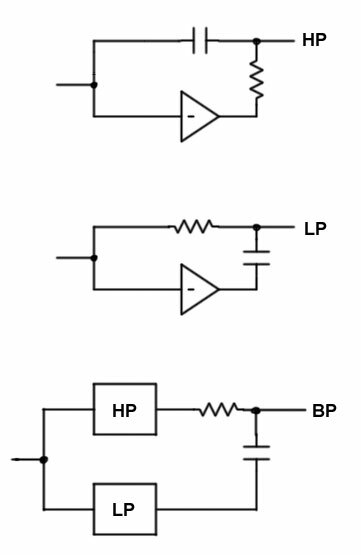 IÃ‚Â´m wondering about the strange circuit, the outputs suggest a state variable design, but a really deviated one? I canÃ‚Â´t make out the integrators, and what are these strange feedback paths? VT4 sets the gain of the feedback, and therefore the effective size of R8 and C6 (coupled via C5) in the passband. VT1 is used to normalize the input voltage, so the output stays the same size as gain is adjusted. as the gain is increased R8 becomes smaller, and C6 becomes larger, opening up the bandwidth. VT3 is used to adjust the lowpass (simple RC with C6) independent of the highpass, effectively moving the center frequency. i am not certain why VT2 (and therefore the gain to the lowpass) is adjusted at the same time (or why the gain is so low with no control current - 10M/10k?). the resonance im not so sure about either, but im guessing that adjusting R7 shifts the phase of the feedback signal as it enters C6, and the more it gets out of phase, the more the feedback becomes positive, and therefore increases gain in the passband. that is a bit strange. The MFB explanation makes some sense, though IÃ‚Â´m not totally getting it atm. That would mean HP and LP outs are each -6dB/Oct., but it sounds much steeper with small Bandwith and then I kind of thought of the *Bandwith* control as a *Slope* control in these modes and what slope is there to decrease from -6dB downwards? Over the years I have had several attempts at working this out too, but to no avail. Most multiple-feedback filters seem to be based around a single op amp, so no joy there; I have also scoured my many filter books on more than one occasion to see if I can spot it, but no luck so far - I live in hope that one day I might find an old obscure filter paper with something similar in it. Perhaps someone should work up the courage to ask Don directly, though I suspect as it was so long ago I wouldn't be surprised if the way it came about has been mostly forgotten. I wouldn't be surprised if the way it came about has been mostly forgotten. Think this in fact the true answer to the question of topology. A bunch of lefties hanging around looking suspicious and probably not paying their taxes... kids these days. i would say its both. if the bandwidth adjustment actually works as ive guessed above, then it truly is genius. im pretty sure an MFB can be built with all the components reversed, so the highpass stage comes first, and then the lowpass. so if you swap the resistors for capacitors (and vice versa) in your drawing, then it matches more closely. i used the same model that tim posted to think about it as well, except there is also an attenuator stage proportional the K2 gain before the whole thing - which is also in most MFB filters. in the above schematic this is accomplished with R1 and R2. an MFB filter is different from a VCVS filter in that it doesnt use positive feedback to get adjust Q, it just has a lot of gain. it then attenuates at the input, to scale everything. i think the deeper slope you describe is because of the Q. in the passband, the slope will be much greater than -6dB, and then will soften off to -6dB at the frequency extremes. this is particularly true if the bandwidth is small. i still dont know what K1 is about. i wonder if its to compensate for attenuation due to negative feedback as you let lower frequencies through (K2 is negative). this thing has really been bugging me, so i did some more digging. i think its an active twin-t filter. its just not drawn like it. the thing that tipped me off, is that C2 and C5 are identical, and the trimmer R7 is such that it can add with R6 to have the same value as R8. twin-t filters are really sensitive to component matching, so adjusting this would definitely peak the filter. if you rearrange the components so those R and C values are parallel to each other, and then wrap the 2 gain stages around it, it starts to look like a standard twin-t bandpass, which would be a reasonable place to start if you wanted to design a bandpass filter. "he probably dropped some acid and kept adding on parts until it sounded right"
As mentioned it's a hack or a masterpiece. I tend to think it's both. I also feel this way about Serge designs. Where some obscure part (like the LM3900) is used in weird and wonderful ways to achieve the desired circuit function. Things that most people probably wouldn't try, think of, etc. I find myself impressed by these sorts of things, as I wouldn't think of them in a million years. I don't know how true this is, but I've heard that Don tended to buy up a lot of surplus components, and then create designs around what he had to work with. This may be why some of these oddball designs came about. When I think about building something, I tend to go with the little building-blocks that I know, and then pick the parts to achieve that, rather than start with the parts, and make them work. Once again, I don't know how accurate that is, just something I've read/heard. This also reminds me of programming and coding analogies, where there are tons of ways to arrive at the same basic functionality. I've known some really good programmers that can't decipher someone else' code despite their high skill level, and would have programmed it an entirely different way. Either way gets to the end result, though maybe one way is more conventional, and one is entirely oddball. Cool to think about anyway. When I removed the adjustments, and parts for gain and stability, I ended up with the same diagram as Tim did. Though I positioned the parts a little differently to highlight the classic RC lowpass and highpass elements. i am fully convinced its based on a twin-t at this point. the 2 matched RC networks create an allpass filter between their midpoints. the feedback signal is taken through a variable highpass filter of C6 and VT3. this phase shifts it one more time, allowing the feedback to become positive for a selected frequency, while the others are negative and attenuated. adjusting K2 changes the amount of feedback, and therefore the Q. the gain stage of K1 is there to decrease the bandwidth as the center frequency goes down, so the relative bandwidth stays constant. i dont have a good physical understanding of how it does this, but the equations say so. if anyone is interested i can post a redraw of the schematic that shows this more clearly, along with the transfer function. if anyone is interested i can post a redraw of the schematic that shows this more clearly, along with the transfer function. Yes, IÃ‚Â´d be highly interested! Just to make sure, youÃ‚Â´re approach defines C2/VT2 as HP CR and R6/R7/C5 as LP RC and then C6/VT3 as the BP RC? But if so, why does R7 not shift one of the frequencies but adjusts resonance? Aka three filter caps, but only two variable R...? Sorry, if IÃ‚Â´m thick here, IÃ‚Â´m happy to be talking to you all. Most definitely, as I couldn't quite get what you meant from your previous description, and it was only late last night that I managed to find my old notes on this, and I haven't had any time to go back through them and refresh my memory about what it was all about. It looks as though I was trying to find a simple way to represent my gain 'k2' in SPICE so that I could convince myself that the whole approximation is a valid one (and from subsequent work I now have some hope I can do this). Look what this nasty thing has done to an innocent saw wave! here is a redraw for how im thinking about it, in this case the R and C values are placed in a manner to show the symmetry. i tried to keep some consistency with tim's block diagram, but thats mostly just K1 and K2. the R and C's being matched makes a phase shifter of equal amplitude between V2 and V3. by turning the resonance pot, you can either place a slight dip in amplitude at the 90 degree point, or a slight increase in amplitude. 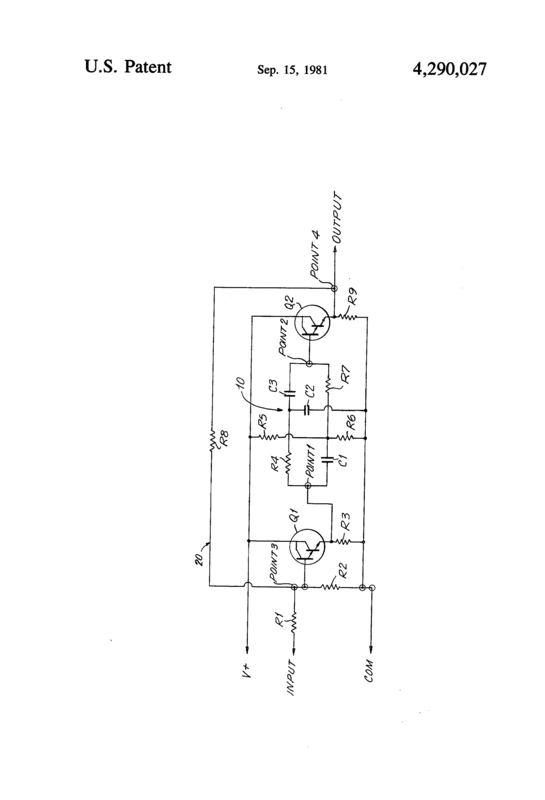 this changes the circuit sensitivity and therefore any self oscillation and ringing. this phase shifted signal is then sent through R2/C2 where it is shifted again, until the one of the frequencies hits 180 degrees, and the K2 inverting stage becomes positive feedback. or at least thats my best hand waving. you can analyse it without the gain stage (K1), and its pretty straightforward. the gain is constant regardless of K2 or R2, and the resonant frequency is set by R2 alone. but, the bandwidth varies with both K1 and R2, which is why i think the gain stage was added. i made an approximation when writing this out, and that is that no current flows from V2 into C2 (ie there is a buffer at this node). its not a bad approximation for R2 greater than 100k, or frequencies below 5kHz, and it made things a lot simpler. there is still a fair bit of cross coupling between K1 and K2, but not as bad as without it. i just realized an error in the analysis. the gain stage K1 should have a gain of (1/(K1 + 1)). it cleans up the equations a bit. the BW stays the same, but Am is less dependent upon on K1 and K2, and W is less dependent upon K2. Unfortunately I haven't been able to spend as much time on this as I would like - things have been conspiring to keep me away from it (mainly fixing-up three broken M15 VCOs), but looking back at my old notes I can offer a few things. Firstly thanks for posting the extra detail: you seem to have a much more intuitive grasp of how all the signals around the circuit interact - myself I find I have to rely more on algebra, by simulating the heck out of it at first, removing extraneous components that are having little effect, and when I'm down to the bare basics of the circuit, then hit it with the algebra. Perhaps an unfortunate consequence of this is that the algebra can very quickly become intractable, making one think more simplification/removing components from the analysis is necessary. From this we see the BP is 6+12dB, LP is 12dB, and the so-called 'HP' point is actually 6+6dB. I had also noted that I wasn't so sure if my simplified topology included all the salient points: it seems gain 'k2' really ought to include a pole in order to better match the circuit; it was how I could implement this easily in the simulation, so that I could then see if the simplified topology was a fair reflection of reality, that defeated me last time (but as I noted above, other work has given me ideas as to how I might actually do this if/when I can find a decent amount of time to devote to it!). i promised myself i would let this thread die, but i talked with don today, and he said the 291 was based on the formant filters max mathews was using for his vocoding research at bell labs. im guessing the circuit would require a fair bit of modification, as during max's time it was more likely to be inductor/capacitor based than opamp. max was pretty much the source of everything it turns out. i talked with don today, and he said the 291 was based on the formant filters max mathews was using for his vocoding research at bell labs. im guessing the circuit would require a fair bit of modification, as during max's time it was more likely to be inductor/capacitor based than opamp. max was pretty much the source of everything it turns out. With your Ã‚Â´pseudo-twin-tÃ‚Â´drawing the penny has dropped for me, btw. Seems coherent with daverjÃ‚Â´s concept. Thanks, it was much more than I had hoped to learn. Today I finished my first Euromodule self etch version of this filter, with different driver circuit though. IÃ‚Â´m pretty happy about this right now! It sounds so funky and sharp. while I barely follow this discussion it has rekindled my faith in the internet and muffwigglers in particular. geek on with yo geek selves!